If you are looking for inspiration to renew your home or office decoration, the geometric style is an excellent choice that fits all spaces. When you start a process of decorating homes or offices, you must first decide what you want to convey. Elements such as lines, colors and lighting, influence how each space is perceived. Therefore it is necessary to first understand the effect geometric shapes in decoration, so you know place and combine it correctly. 1.- Provide dynamism: the geometric design applied on large surfaces, creates an illusion of movement and makes the energy flow in the spaces. 2.- Generate a strong sense of order: for this you must use perfect symmetrical designs. 3.- Create a focus of visual impact: if the design is intricate and incorporated strategically, for example in a large box or in the upholstery of an armchair. You can plan an entire room of your home decorating project with geometric patterns, or add to an already decorated room. Lines and geometric shapes adapt to many styles. You can choose a combination of black and white for a minimalist style, but dosing the role of design. If you want a retro style, you can not miss a print in colors like yellow, red and brown. The geometry also present in ethnic colors, with patterns that repeat especially in textiles. You can combine more than one geometric print, but you must be careful not to overload the space visually, and always take care of the harmonious combination of colors. For children rooms, it is interesting to combine geometric decorative elements that also function as didactic elements. A very simple, economical and clean way to incorporate geometry in your spaces is the use of wall decals. You can use a wallpaper and cover an entire wall with a geometric design. This can be done without the need to cover all the furniture as if it would be if you used paint. Furthermore, the vinyl ensures prolixity geometric design. 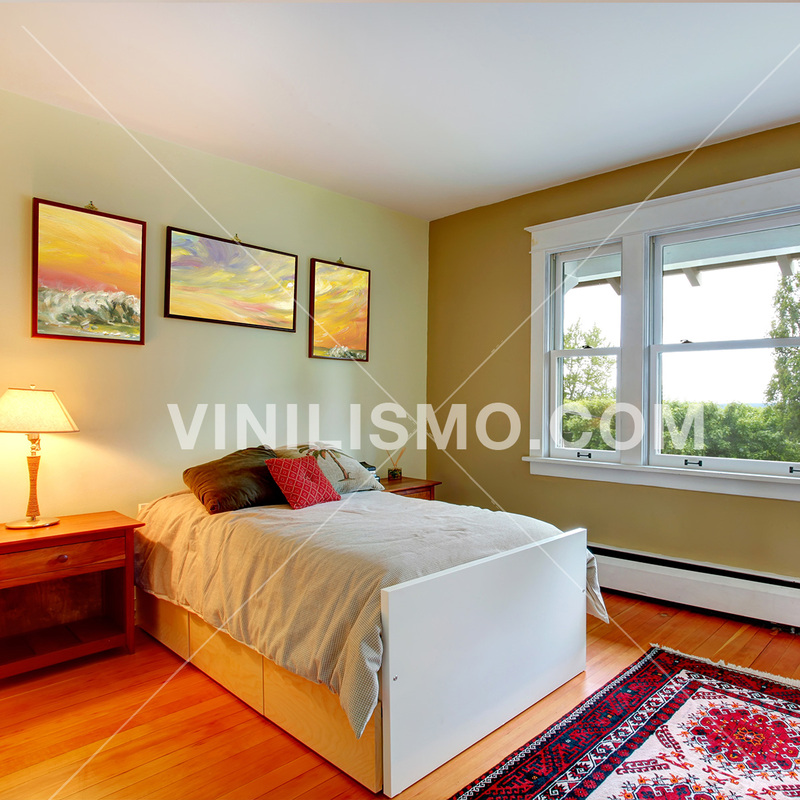 Another option is to place vinyl as pictures or loose forms on a smooth wall. To do this, you must measure very well the location of the wall decals to achieve greater impact. Look the catalog of the wall decal store to find a design that surprise you, or request a custom design. There are figures that give illusion of volume, creating focus of attention in the rooms. The offices are also ideal places for a decoration with geometric motifs. The forms will add a modern, innovative and impactful look to your workspace. Vinyls are very good on the walls of the stairs, and allow to life and dynamism to a place that is often out of the projects. One of the advantages of vinyl is that it is possible to renew your space without spending much money and without causing discomfort, as they are very easy to remove and install. Now that you know how, dare to renew your spaces with geometric decoration. This entry was posted in Interior Decoration, Wall Decals, Wallpaper on August 19, 2016 by Vinilismo. This entry was posted in Interior Decoration, Wall Decals, Wallpaper on May 6, 2016 by Vinilismo. This entry was posted in Interior Decoration, Wall Decals on February 6, 2016 by Vinilismo.